Niki Jackson is the latest Arizona player to make it to the professional level. 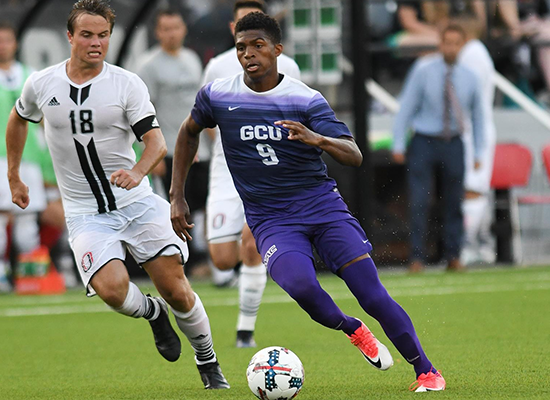 The four-year starter and recent graduate at Grand Canyon University was selected by the Colorado Rapids with the 73rd pick. Jackson grew up in Scottsdale and has played locally for Sereno Soccer Club and Phoenix. He also played in Arizona's ODP program from 12-13 years old. Prior to joining the Real Salt Lake - Arizona Academy in Casa Grande, Jackson moved to Brazil and played for Cruzeiro. He attended Cactus Shadows High School. At GCU, Jackson scored 40 goals and notched nine assists in 70 matches. In 2016, his junior season, Jackson was named WAC Offensive Player of the Year and finished with 16 goals, good for third-best in the country. Jackson has now joined the Colorado Rapids ahead of their training camp and AYSA had a opportunity to catch up with Jackson. AYSA: How does it feel to be drafted? Jackson: It is the greatest feeling being drafted. I've been working my whole life for this moment. It's honestly a dream come true. AYSA: What are you looking forward to? Jackson: I'm just looking forward to getting started, getting to know all the guys, and learning from the best. AYSA: What is your favorite memory of playing soccer in Arizona? Jackson: Wow, there are so many memories. I'd say our inaugural opening night at GCU Stadium. AYSA: How did playing in Arizona help you prepare and develop? Jackson: Being in Arizona and playing with so many talented players only raised by level and made me a better player. Being at the academy (RSL-AZ at Casa Grande) helped me prepare professionally being able to train with the first team while playing in matches with the reserves. AYSA: Any advice for younger players wanting to play professionally? Jackson: My advice is to work hard and to never give up no matter how hard it gets. There's so many different routes to making it pro. Just stay focused and determined.